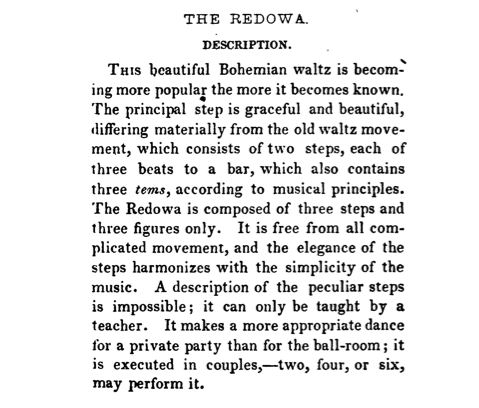 An undulating dance that flies around the dance floor, the Redowa is a perennial favorite. 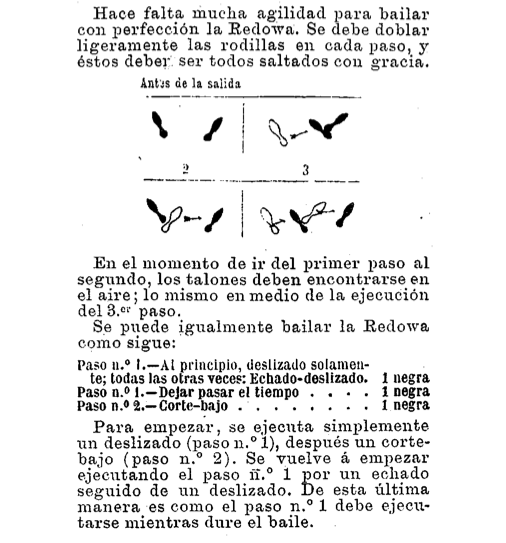 1: The Lead leaps back 90° clockwise around the Follow with his left foot across LOD while she leaps with her right foot between his feet. 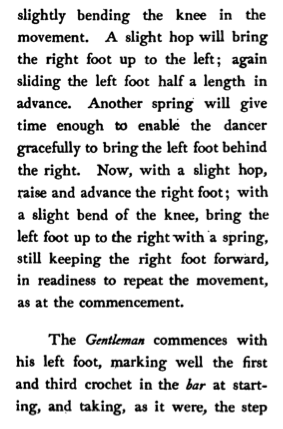 This is a very short step, almost in place, not a traveling leap. 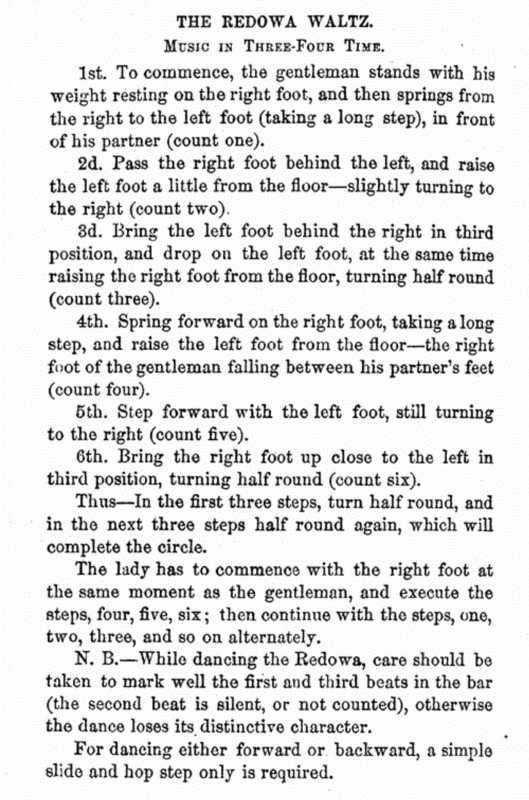 At the end of count 1, he is facing straight back against LOD, and she is facing straight forward along LOD. 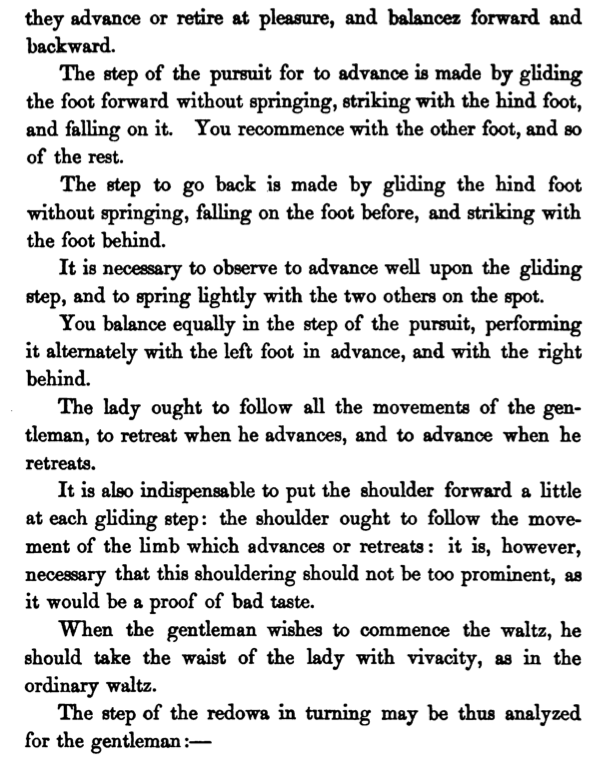 2: The Lead extends his right foot straight back along LOD as far as it can reach, as the Follow extends her left foot straight forward along LOD as far as it can reach, taking weight on these feet. 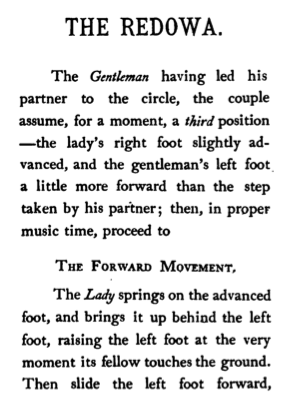 They keep their extended legs perfectly straight, so that the extended legs are parallel, hers below his, reaching straight back along LOD. 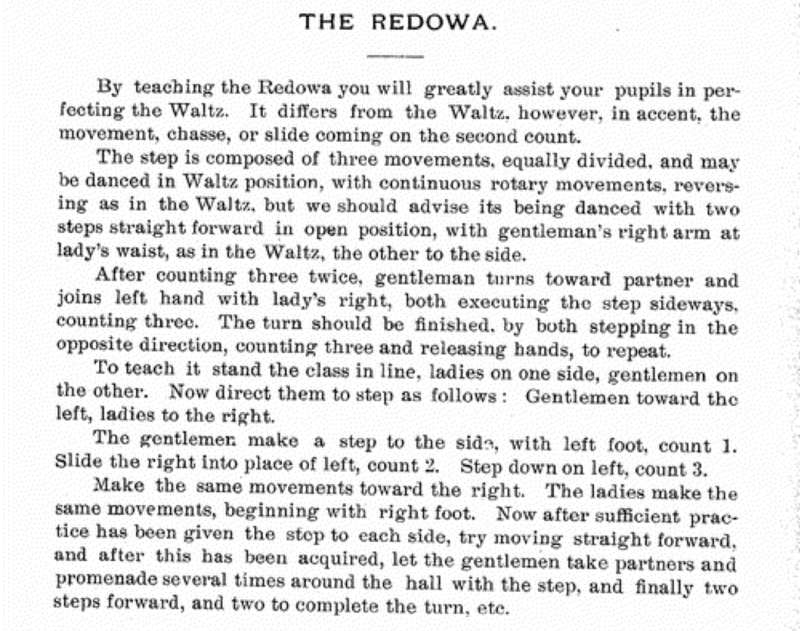 Sink lower on this step, in order to reach farther. 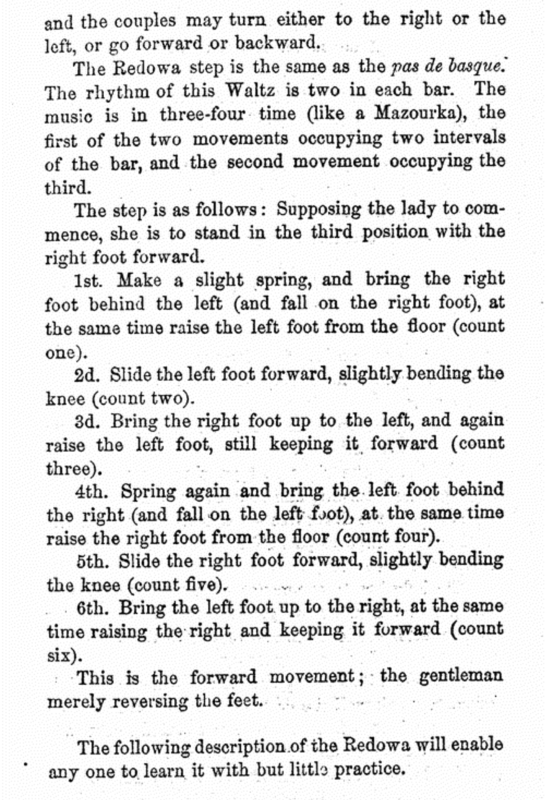 3: The Lead closes his left foot to his right with weight, turning 90° clockwise to face the center of the hall, as the Follow closes her right foot to her left with weight, turning 90° clockwise to face out of the hall. 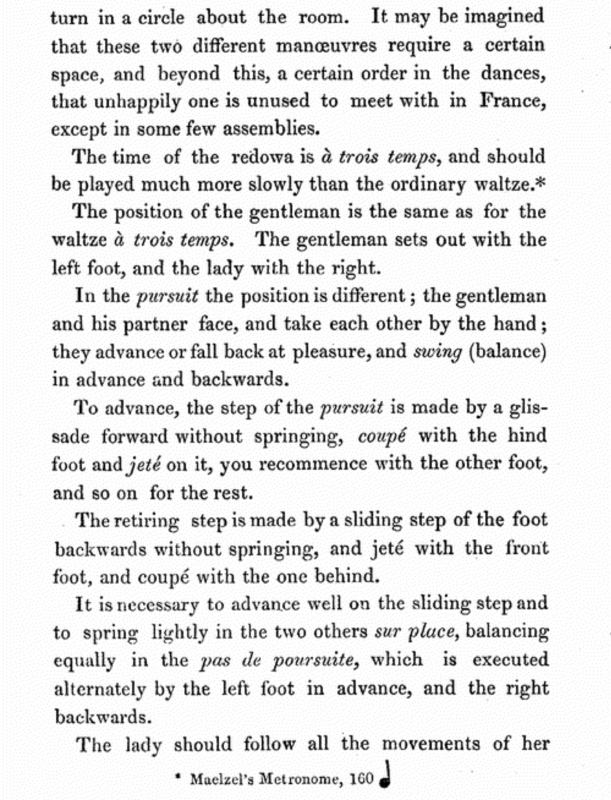 Note: The closing foot can optionally cut under the foot it is closing to, taking its place, rather than closing up next to it. 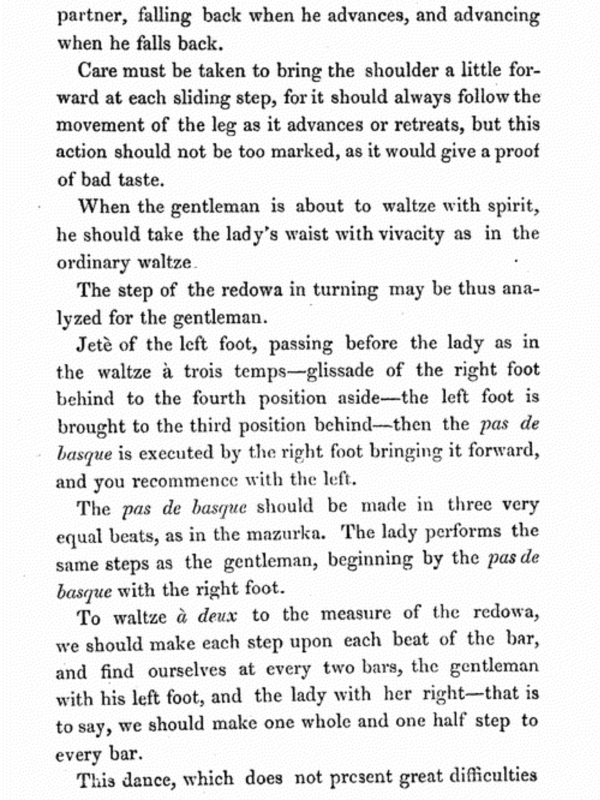 4-5-6: The Lead does exactly what the Follow did, and vice-versa. 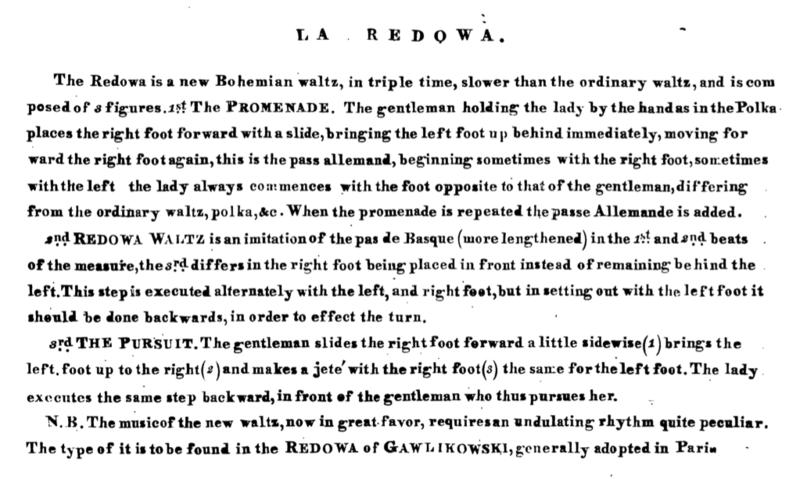 The Promenade: a pas de basque forward, holding inside hands. 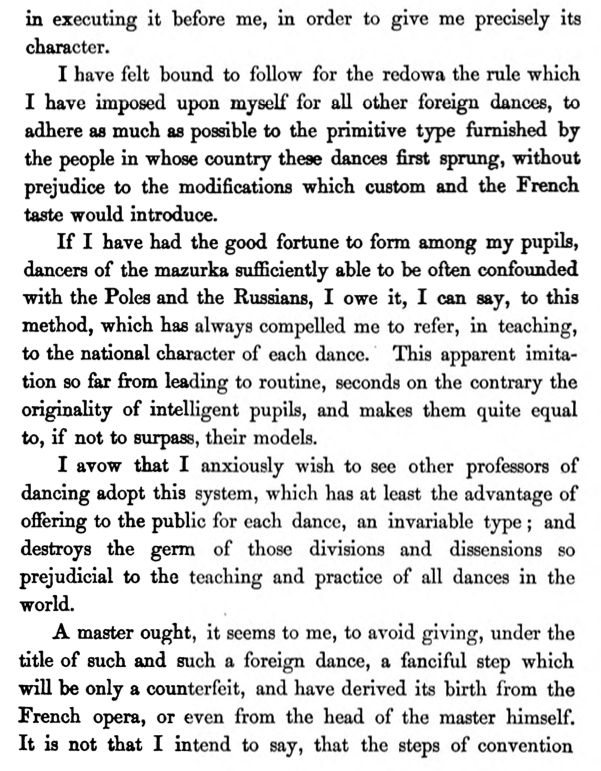 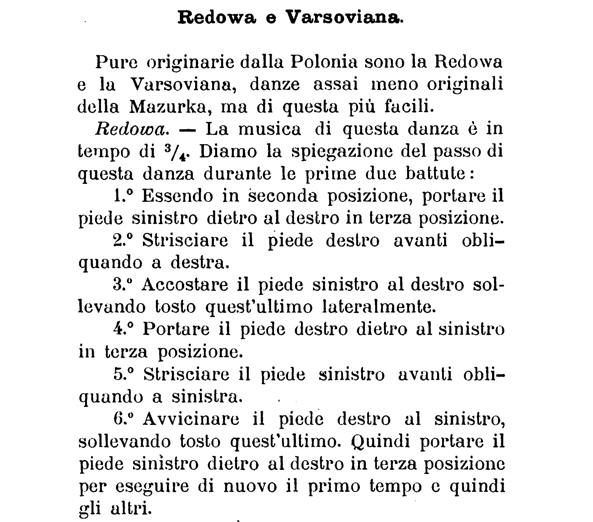 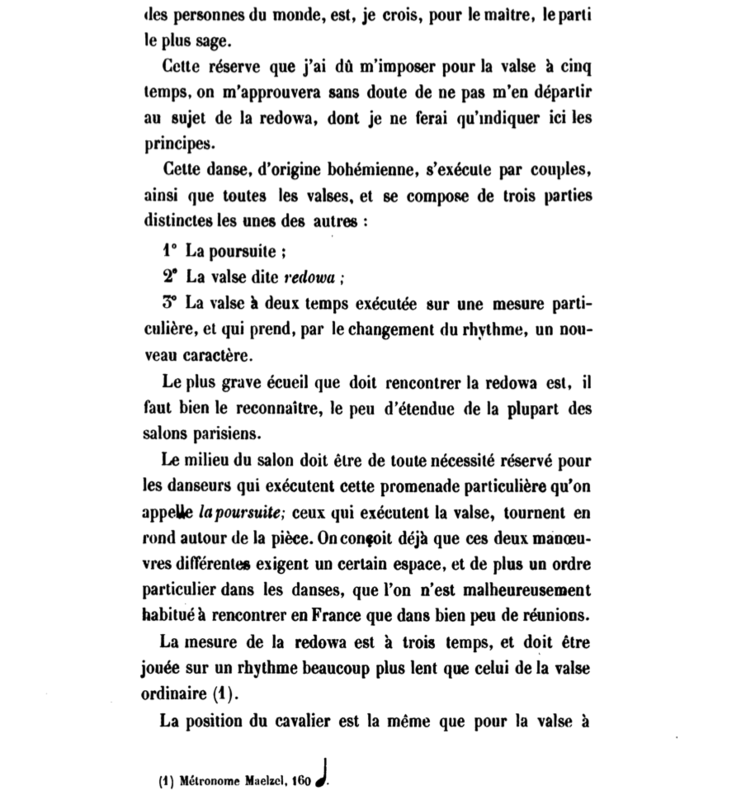 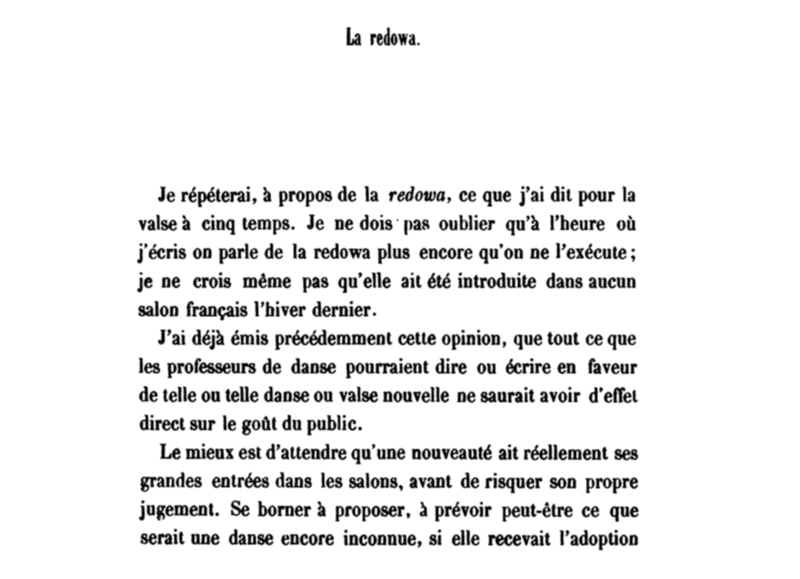 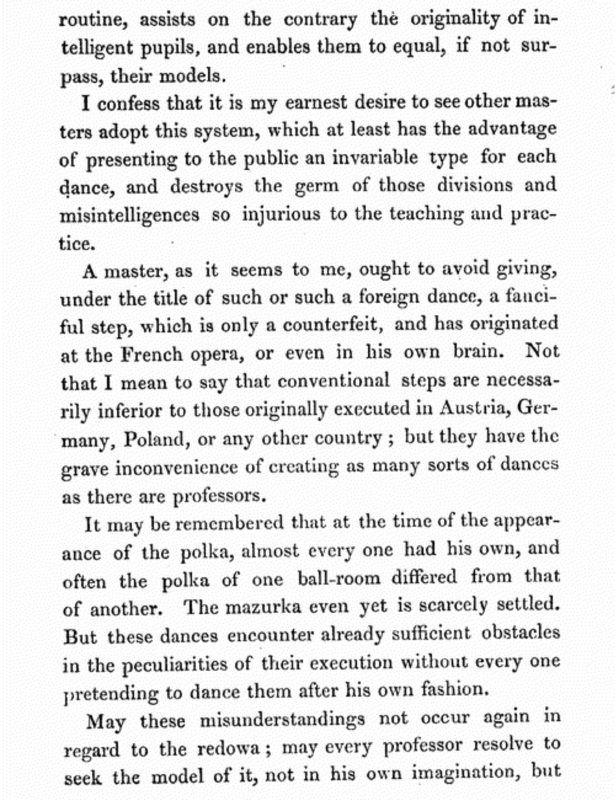 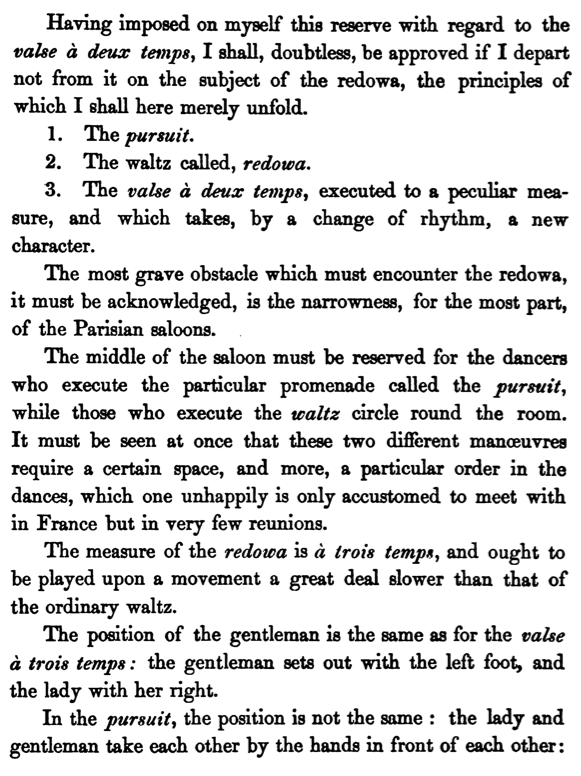 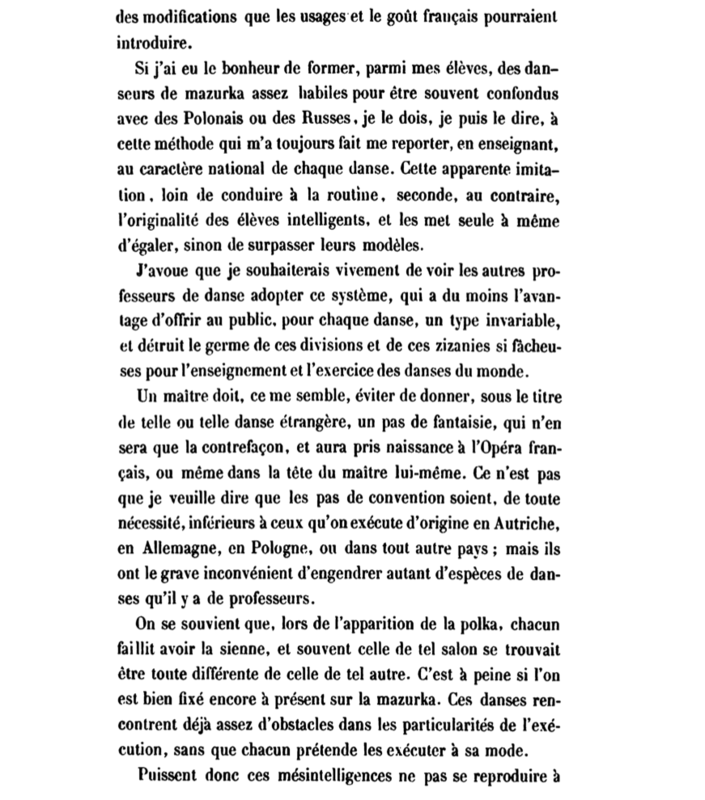 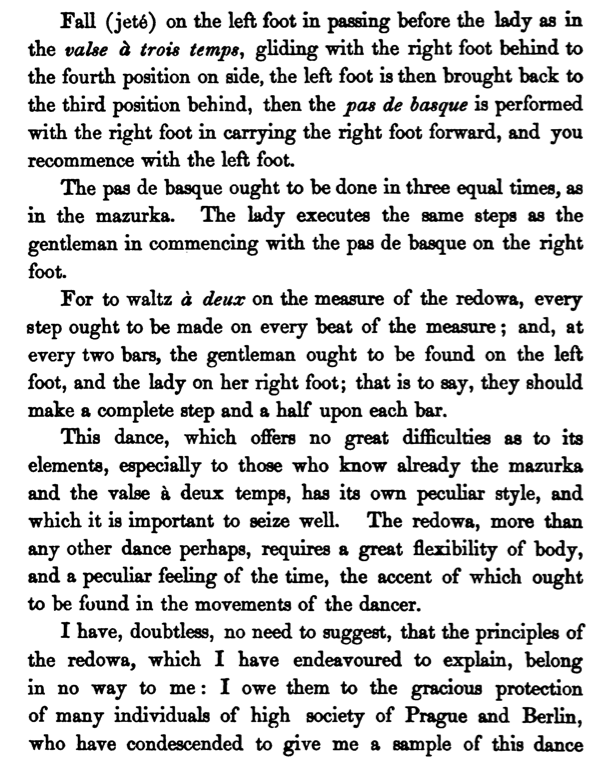 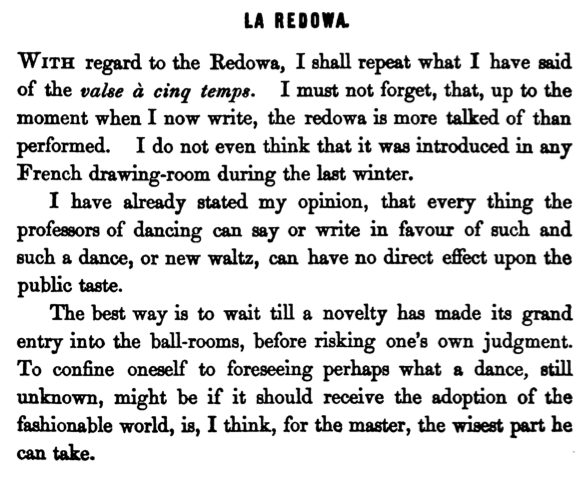 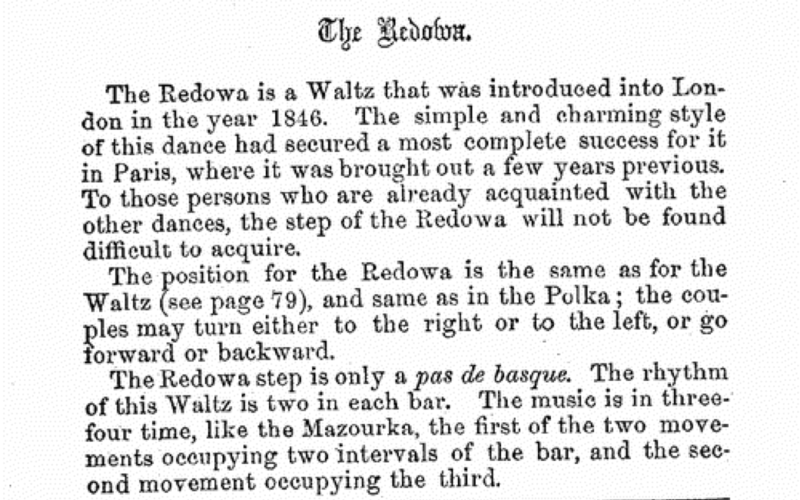 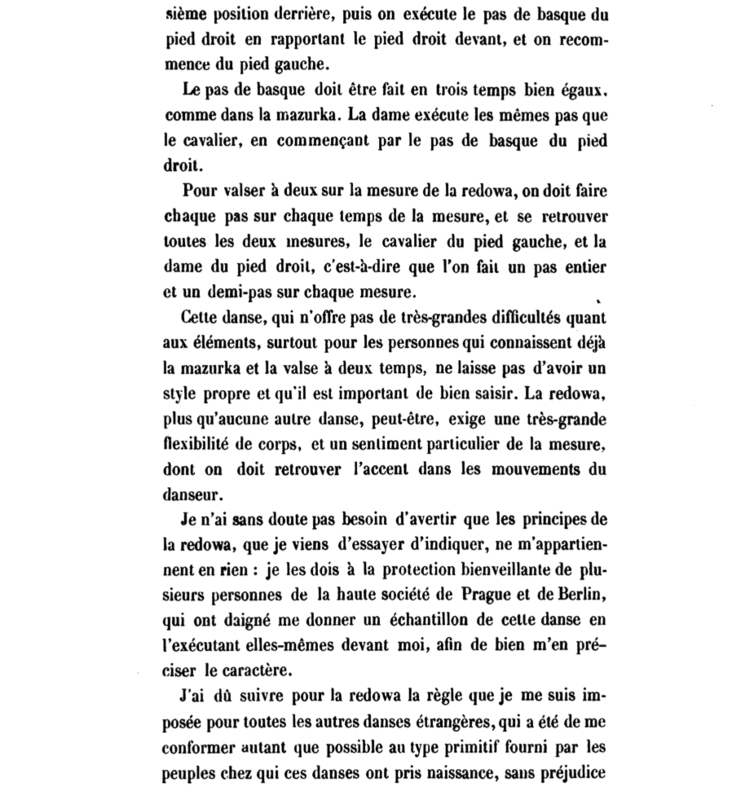 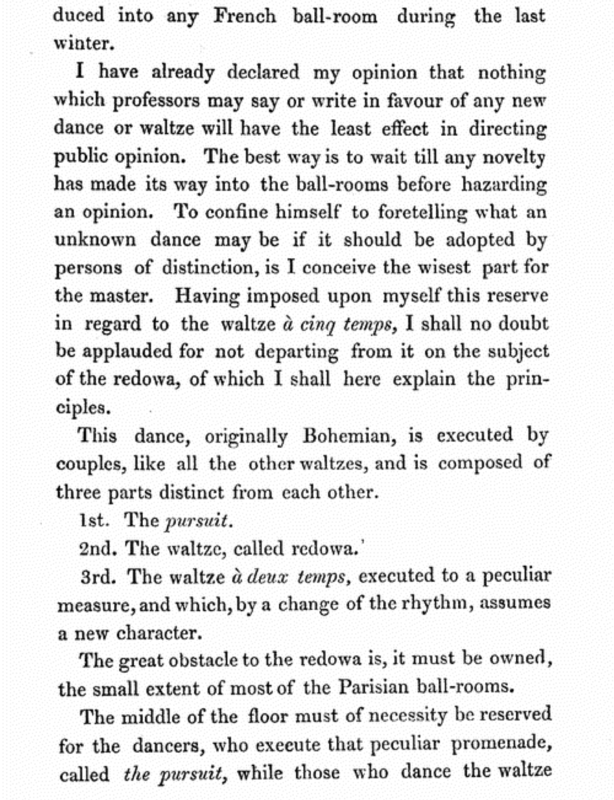 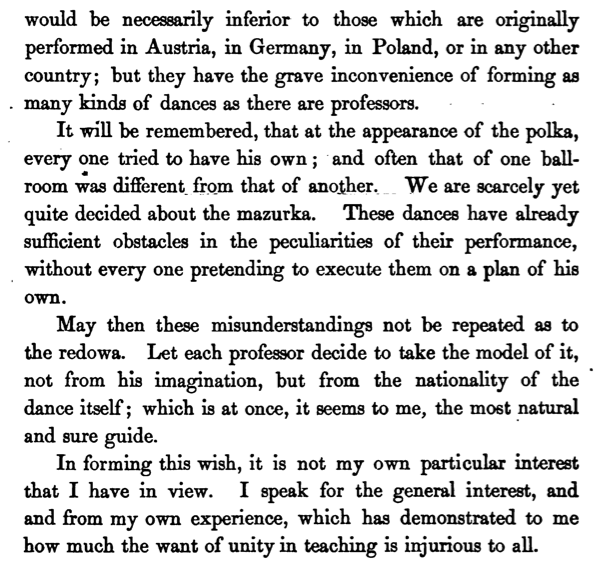 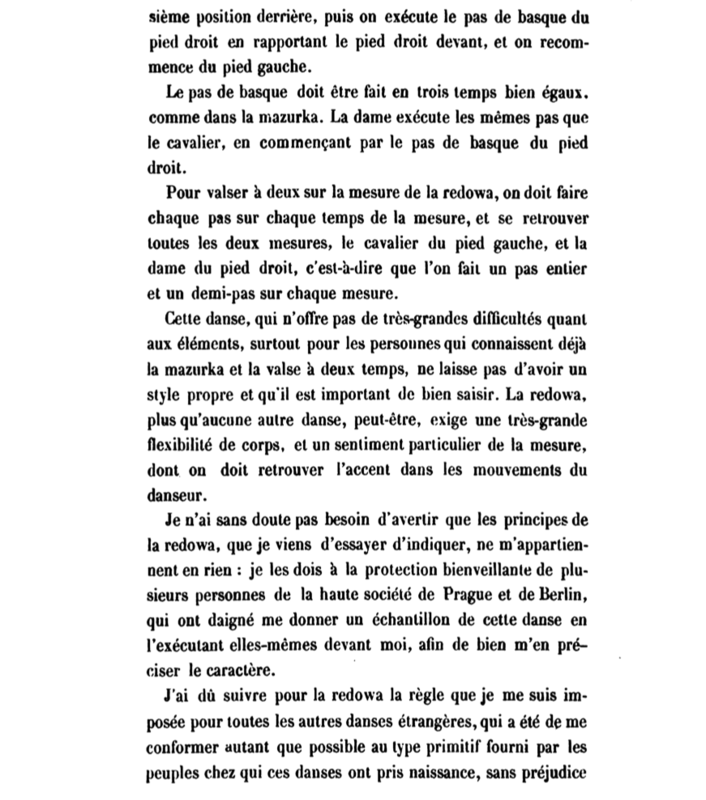 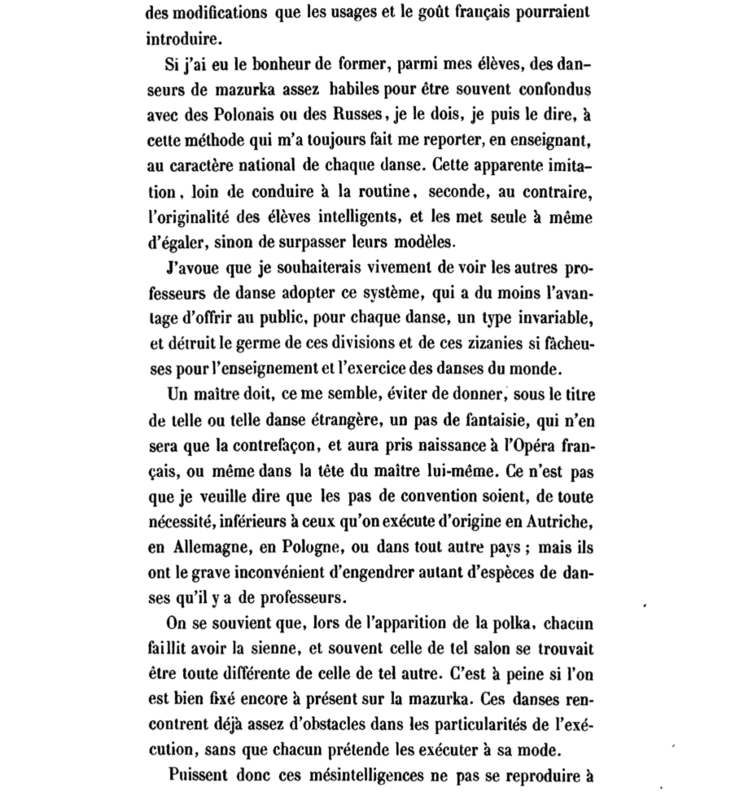 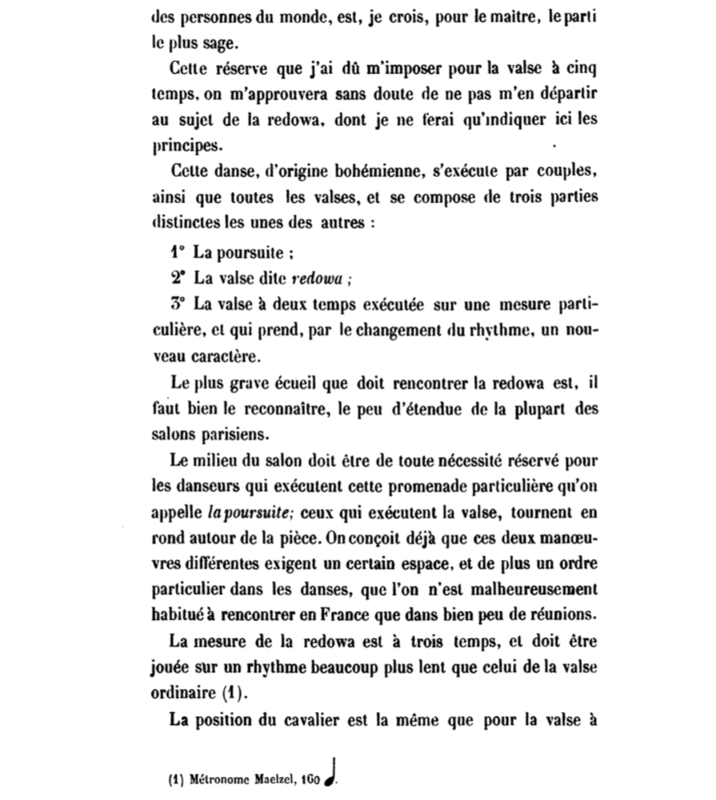 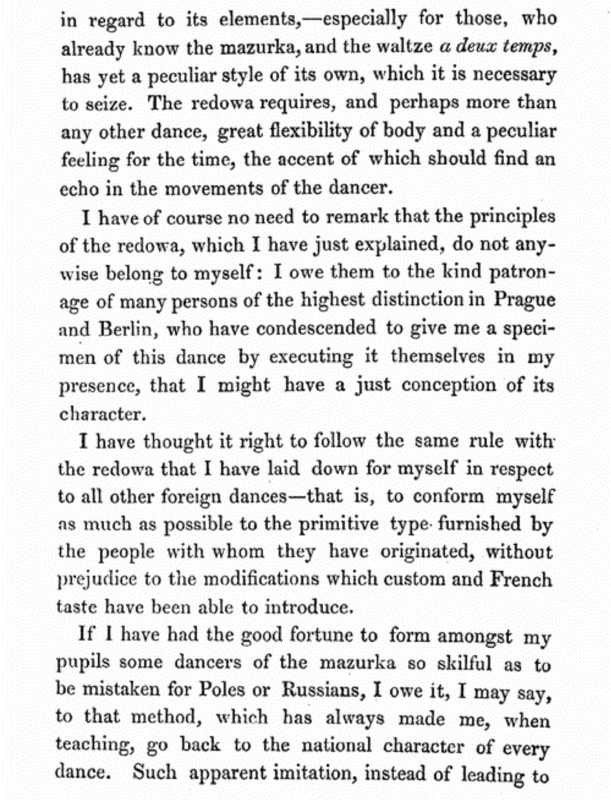 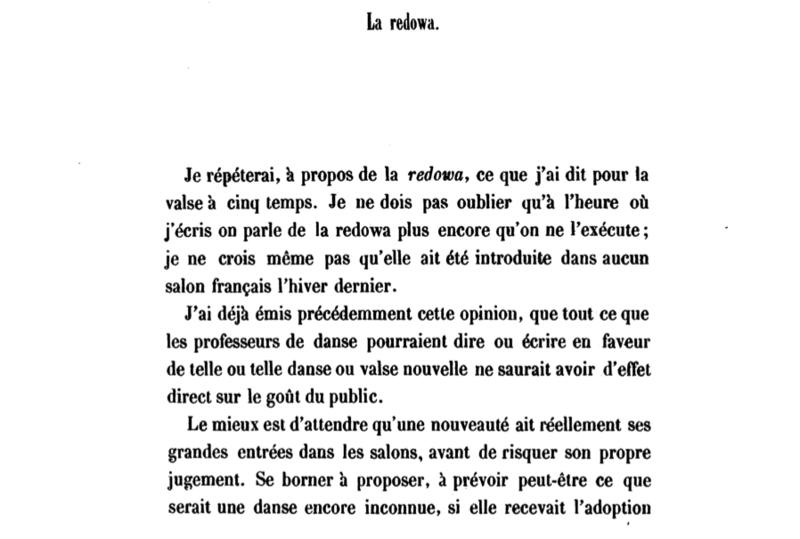 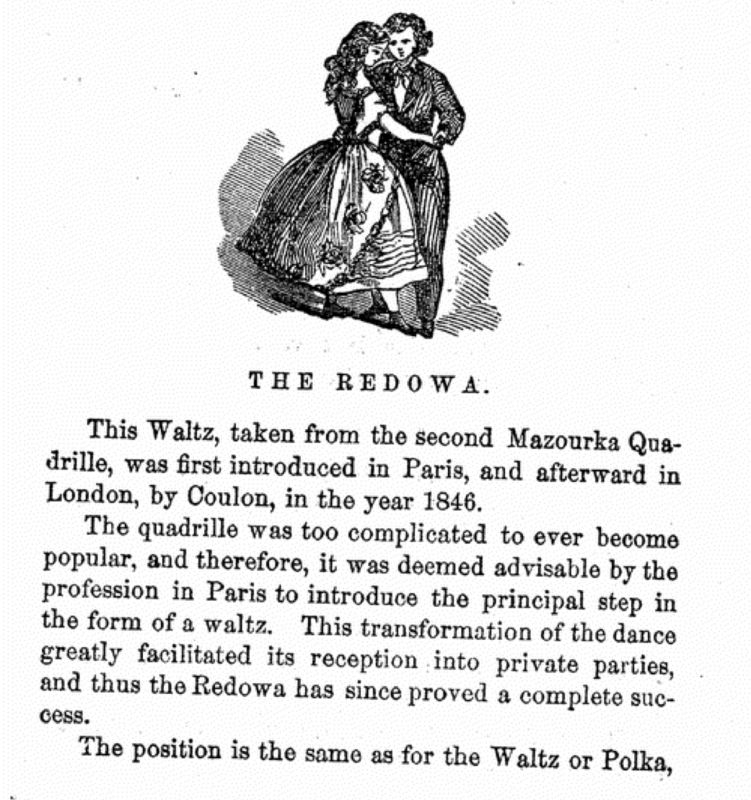 The Redowa Waltz: a turning pas de basque, as described above. 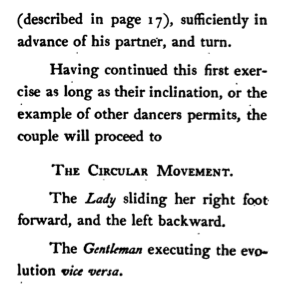 The Pursuit: the Lead does a pas de basque forward as the Follow does a pas de basque backward, in waltz position. 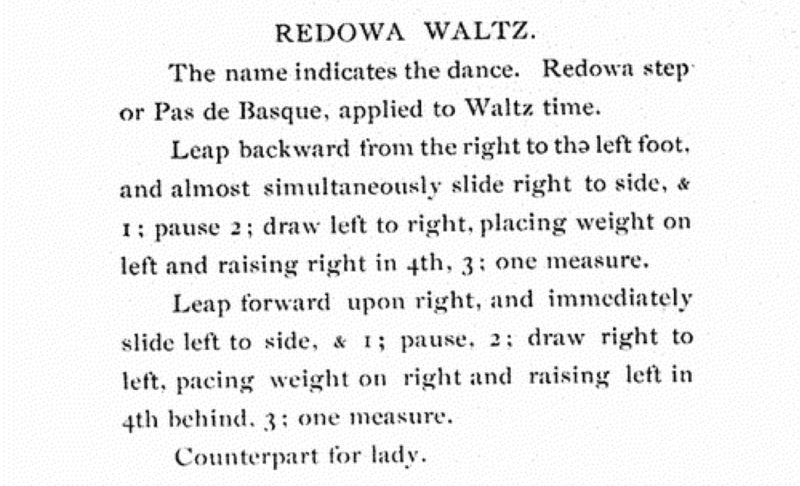 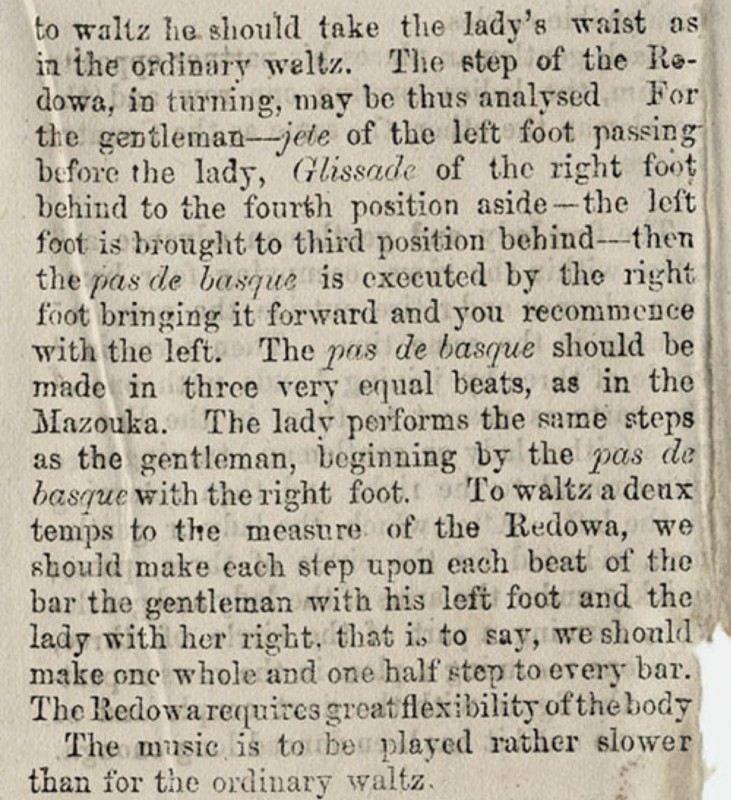 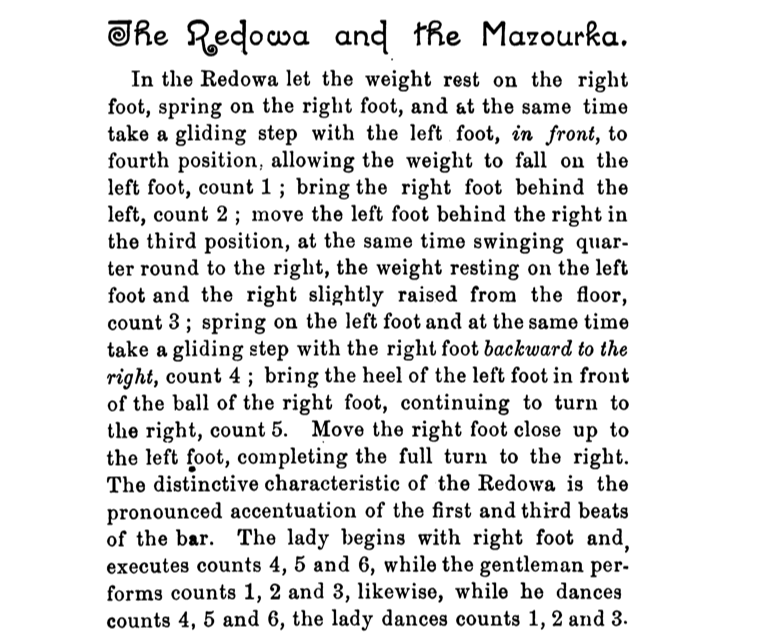 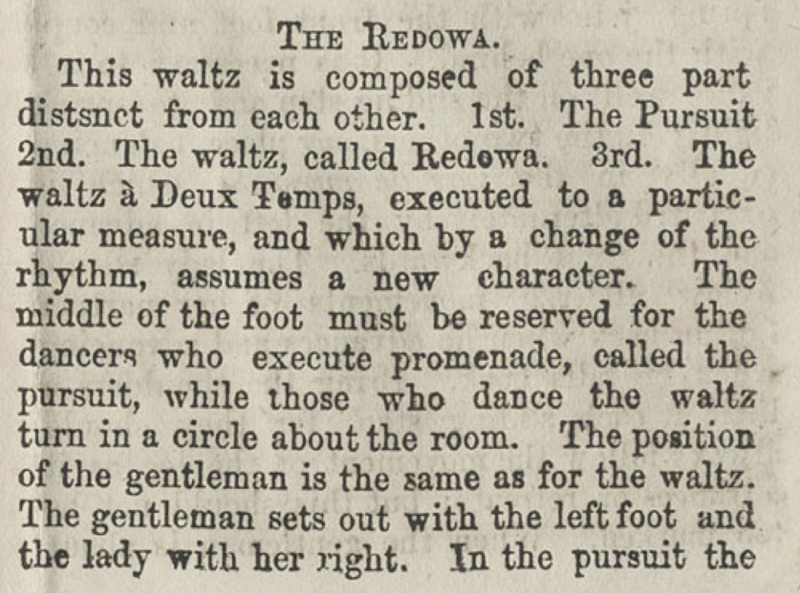 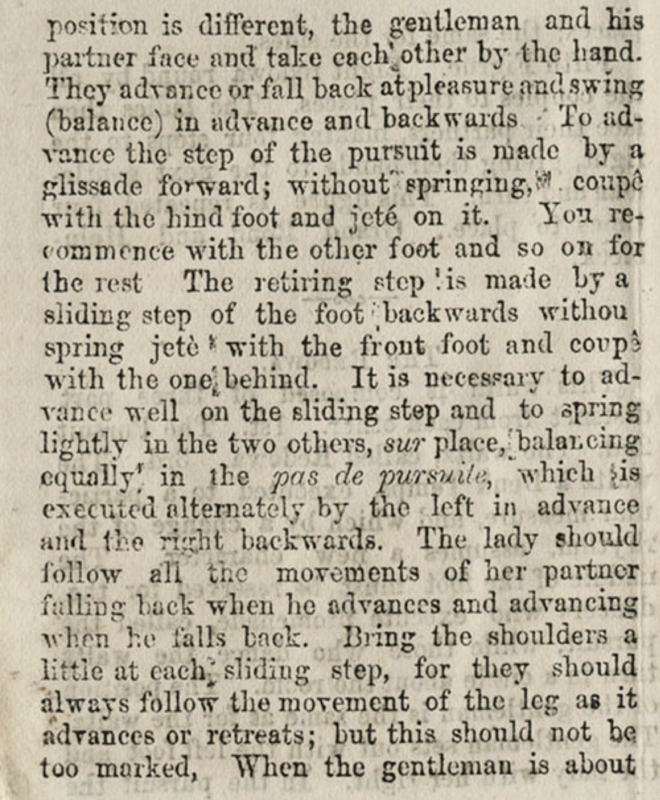 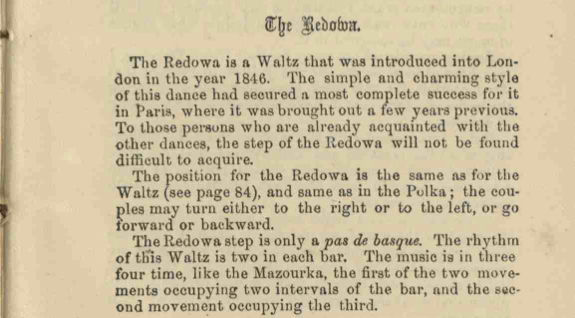 Like most 19th century waltz steps, the Redowa can be reversed. 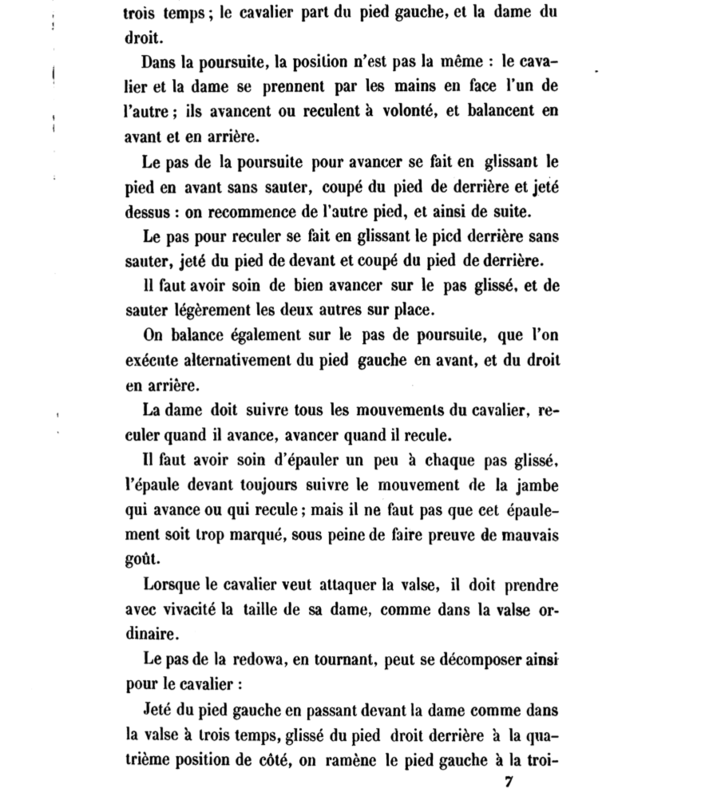 The Pursuit serves as a transition. 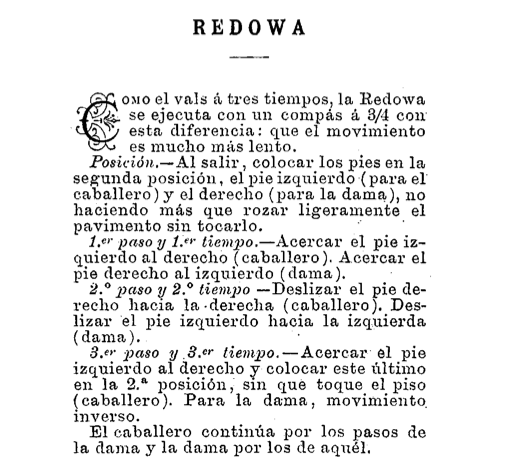 The Redowa can also be performed in Polka time, quick-quick-slow. 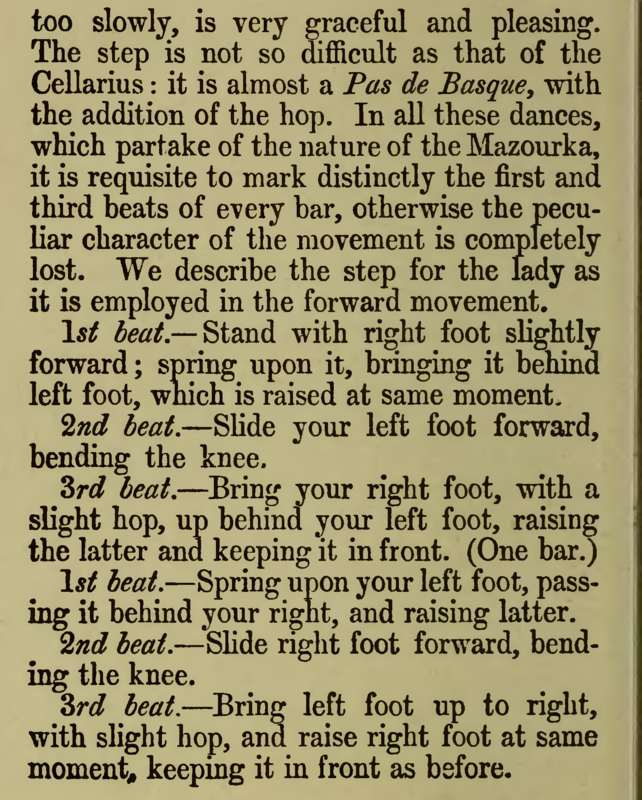 Burgmuller 1846 and Cellarius 1847 specify 160 bpm. 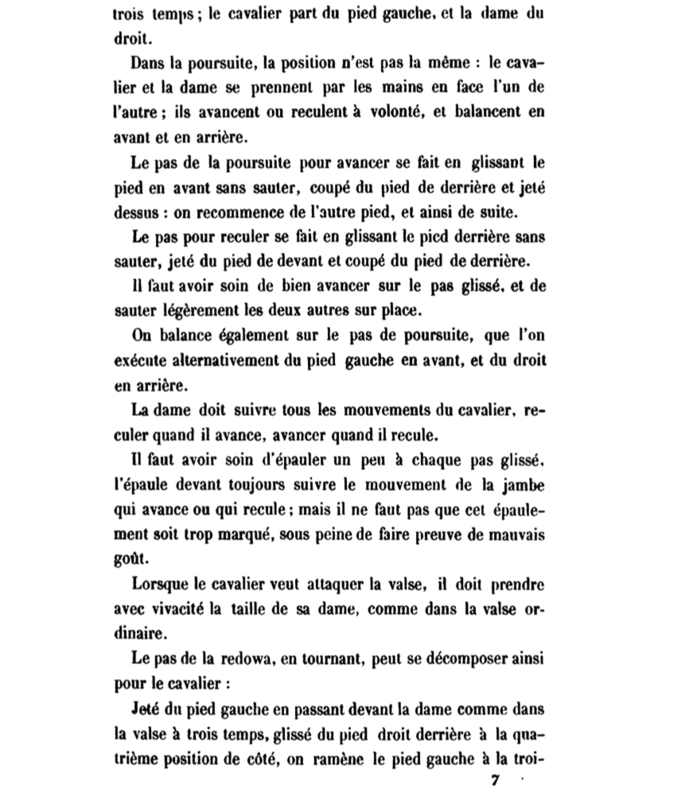 Gilbert 1890 specifies 144 bpm. 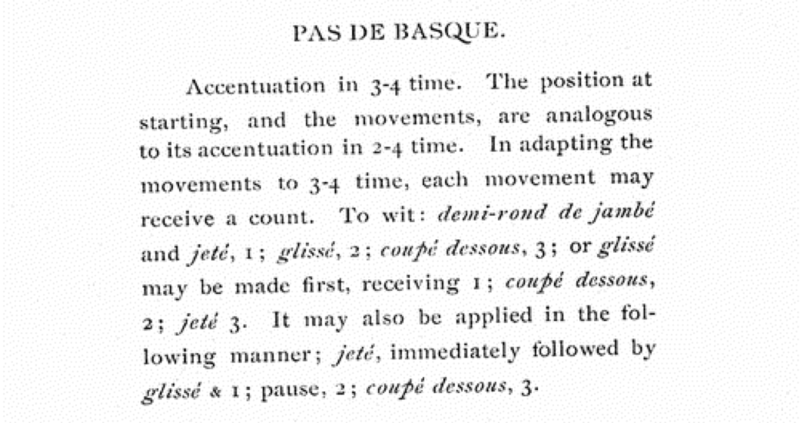 Kopp 1896 gives a range of 135 to 165 bpm. 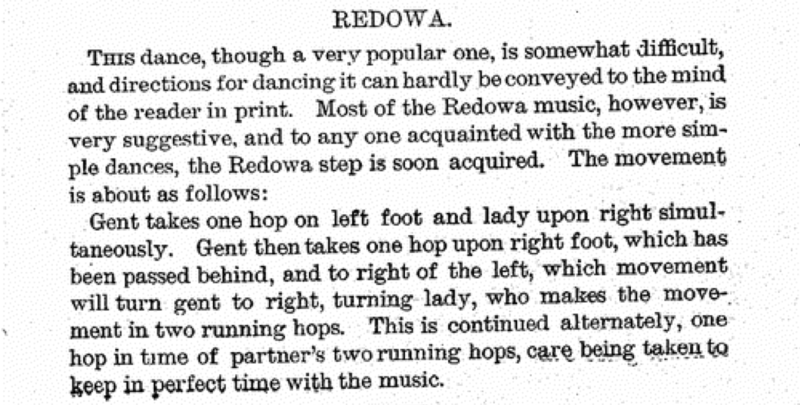 Lopp 1903 specifies 184 bpm. 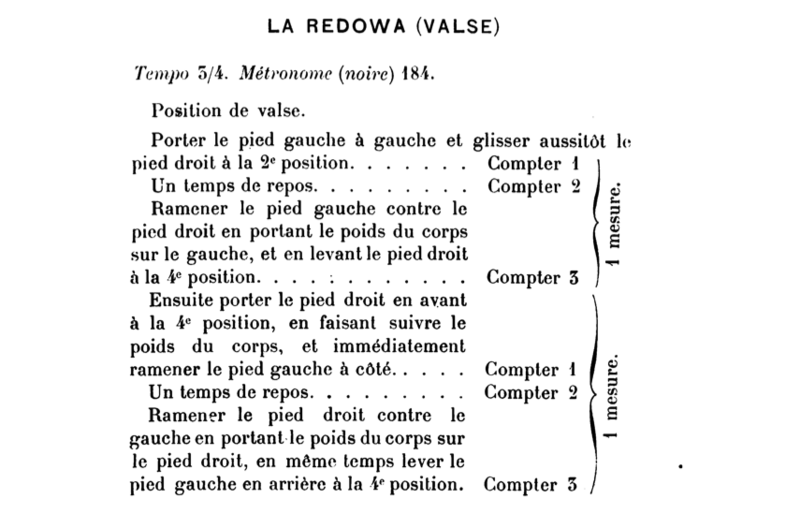 Here are a few of our favorite 21st century Redowa tunes, arranged by tempo.